SKU: 1DEHUSHGI82. 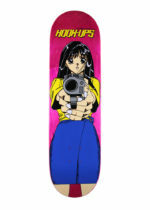 Category: Hook Ups, Hook Ups deck. THIS BOARD HAS 10 COLORS ON THE BOTTOM AND TOP. THIS BOARD ALSO HAS PEARLESCENT WHITE INK.